We have lots of fancy qualifications (we love to learn and teach) and live the happy, healthy life-style that we preach rather than using the old hypocritical phrase of "do as I say, not as I do!". We believe in giving you all the skills and support you need to get you where you want to be but ultimately our primary aim whilst coaching you is to empower you and increase your independance by increasing your personal awareness, standards and skills so that you are fully capable of looking after yourself and enjoy the benefits that being fit, healthy and confident bring to a life-style. ​Only by empowering YOU will we get what what we want! To live your life consciously and deliberately, to start each day with a passionate purpose and have the persistence, confidence, health and fitness to enjoy being you in whatever you choose to do! 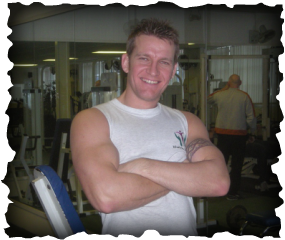 Mark is the managing director of Lifestyles for Living and Phoenix Gym norwich Ltd and has been helping people transform their bodies for over 16 years. After asking for his first weight lifting set at the ambitious age of just 13, Mark knew from that point onwards what he wanted to do. As well as holding a masters in personal training and corrective exercise, diplomas in sports therapy, strength and conditioning and sports nutritional advice Mark also has a masters in the art and science of Neuro Linguistic Programming (NLP) and uses these Jedi mind skills to help his clients overcome mental barriers, excuses, banish unwanted behaviours such as comfort eating and gain control over daily habits like getting to the gym in the first place to exercise consistently. Mark has written articles for magazines, been on channel 4 training participants in a short weight loss series, taught group weight loss classes and helped future radio with their race for life project. Mark is often referred to as entertaining and humerous and takes personal training to a professional level with a serious intent where few have the commitment, passion or experience to venture. Mark helps train professional athletes such as Liam Walsh (european, common wealth and IBF boxing champion) and regularly consults with other top level professional and semi-professional athletes for sports conditioning advice and injury rehabilitation and prevention. Mark has regularly put his physical and mental skills to the test by winning and repeatedly defending the Eastern Counties Masters Super Middle Weight Boxing Title against far more experienced fighters! Mark also helps coach other personal trainers to help them achieve even better results with their clients. Lorna has over 18 years of exercise and yoga experience and realised from as young as 8 years old what the right type of training can do for your body. She is one of the most committed and passionate female personal trainers this side of Venus who lives what she preaches. If woman are looking for an example of a women who does lift weights but still appears "feminine" then Lorna is your girl! Lorna recently put her knowledge to the test by competing in the Pro AM Midlands "toned figure" competition placing highly and qualifying for the British amateur finals! Believe it or not Lorna is the proud mother of a 17 year old, she is very knowledgable about nutrition and likes to teach her clients the weightloss "secrets" she has tried and tested over the years. Lorna enjoys showing women what can be achieved with a little desire and the right types of exercise. Lorna has taught Freestyle Fitness Yoga which has also proven to be yet another effective tool in her creative arsenal for body transformation. Lorna is an exceptional trainer, inspirational role model and is regularly described by her clients as a beautiful person both in and out who brings out the best in people. Paul has an impressive reputation for helping people remove emotional / psychological blocks to achieve their targets in life! If the past is preventing you from living life to the full or you need a boost to help you reach your goals then Paul is your man! Paul specializes in hypnotherapy but also incorporates psychotherapy into his practice. If Paul isn’t seeing clients then you can guarantee he is somewhere in England (or internationally) refining his techniques and keeping up-to-date with the latest effective methods for his clients. Paul is a national speaker and this year was asked to speak at the British Dermatological Nursing Groups annual conference and also at the leading UK Alopecia charity annual Big Weekend. Paul believes in fast, effective therapy to bring the excellence out in you! Bob Wood is a Physiotherapist and Athlete Development Specialist. His speciality is a functional and movement based approach to both rehabilitation and performance. He has spent many years within private practice, sport and education working with individuals, groups and organisations. He has produced numerous articles on all aspects of health and fitness, which have been published in magazines, national newspapers and radio, and has been a regular contributor to both Today’s Golfer and Golf World. He has written chapters and contributions within fitness books, medical textbooks and other media, and is the author of The Functional Training Resource and Functional Integrated Training. As a co-founder of Physical Solutions he has written and delivered numerous courses and works towards constantly developing and re-developing new and established learning themes with varied audiences. He has provided various consultancy and LTAD roles, including to Golf England, Badminton England, Loughborough University, SportsCoach UK and as Athletic Development Co-ordinator for the EGU. Bob has extensive experience in Long Term Athlete Development programmes and writes resources and provides training and education services to national governing bodies, AASE schemes, academies, colleges and schools, as well as working directly with his own client athletes. He is no more than an average golfer, an enthusiastic but uncultured tennis player, a fair weather cyclist, and messes about on boats given any opportunity.